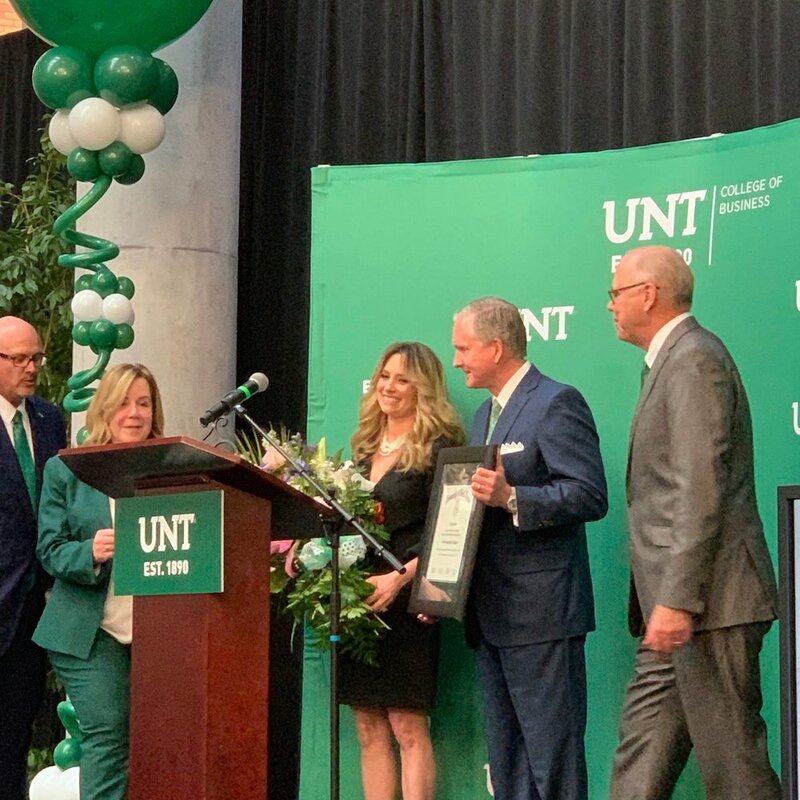 Standing ovation as President Smatresk hands the donors - Brint and Amanda Ryan - flowers and a plaque in thanks for their donation to the UNT College of Business. On Monday afternoon, UNT celebrated the biggest donation the university has received to date. UNT alumnus G. Brint Ryan donated $30 million dollars to the College of Business, effectively renaming it the “G. Brint Ryan College of Business,” pending approval by the UNT Board of Regents. UNT President Neal Smatresk made the announcement in the business leadership building alongside Ryan and College of Business Dean Marilyn Wiley. Hundreds of people gathered to celebrate the milestone amid green and white balloons and celebratory applause. “We enjoy contributions our alumni make, [especially] when they didn’t just get a job certificate but [use their education] to make a difference,“ Smatresk said. Ryan thanked his business professors for pushing him during his time at UNT. He graduated with a bachelor’s degree in 1988 and after finishing his studies, he became founder, chairman and CEO of the Dallas-based tax services firm and software provider Ryan. He also serves as chairman of the UNT System Board of Regents . Dean Wiley noted that Ryan’s donation will allow the College of Business to grow and make a greater impact in the Denton community and beyond. “Education is the best equalizer - it changes the lives of graduates and generations of their families,” Ryan said. All quotes in this story are from the announcement ceremony.